Homes 4 Families hosted its third Celebs4Vets Build at the Veteran Enriched Neighborhood off Soledad Canyon Road in Santa Clarita on Saturday. The Los Angeles-based nonprofit empowers low-income veterans and their families to enter the middle class by providing them with affordable housing and holistic services that build resiliency, self-sufficiency and economic growth. More than 30 celebrities and other entertainment industry professionals picked up hammers and paint brushes and poured concrete to build homes, including stars from YouTube Red’s “Cobra Kai” and CBS’ “SEAL Team,” among many others. Celebs4Vets is a membership-based group comprised of representatives of the entertainment industry who subscribe to the Homes 4 Families mission and lend their support by participating in H4F activities, events, and programs. 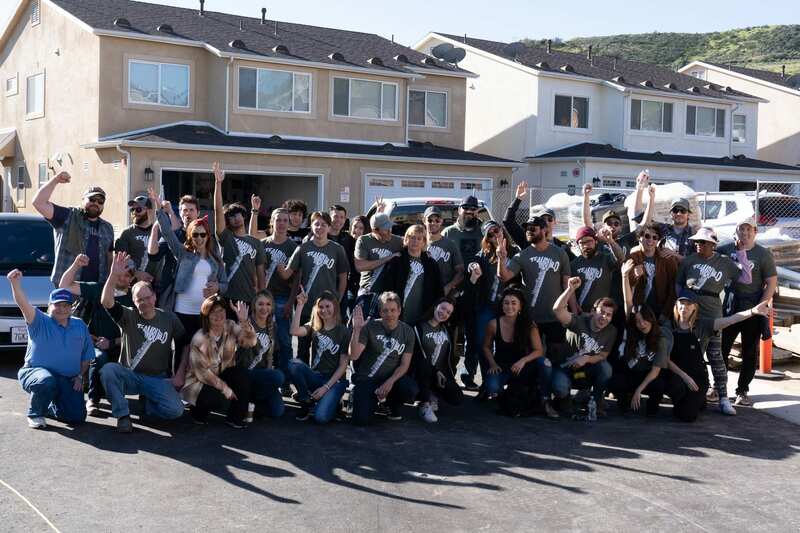 The Celebs4Vets Build provided members with the opportunity to help build some of the remaining 9 of 78 homes for low-income veterans and their families in Santa Clarita before H4F moves on to build another 56 veteran homes in Palmdale. Celebrities each rolled up their sleeves to spend the day painting homes, doing finish carpentry, and pouring concrete driveways while also calling upon their fans to sponsor their efforts, raising money for their building supplies and materials. The participants included: John Ross Bowie (Speechless); “SEAL Team” cast members Toni Trucks and Judd Lormand; “Cobra Kai” cast members Tanner Buchanan, William Zabka, Mary Mouser, Xolo Mariduena and Jacob Bertrand; Johnathan Fernandez (“Lethal Weapon”); Phillip P. Keene (“Major Crimes); Noah Emmerich (“The Americans”); Drew Powell (“Gotham”); Tate Ellington (“The Brave”); Natacha Karam (“The Brave”); Edwin Hodge (“Mayans M.C.”); Reed Diamond (“The Purge”); Amy Paffrath (“Entertainment Tonight”); Drew Seeley (“Max and Wrigley”); Anna Konkle (“PEN15”); Sean Maguire (“Once Upon a Time”); Grace Kaufman (“Man with a Plan”); Bella Shepard (“A Girl Named Jo”); Reid Miller (“Play by Play”); Rod Man (“Last Comic Standing”); Al Coronel (“Bosch”); Matt Micucci (“Life is Boring”); and ‘Cobra Kai “writers Hayden Schlossberg, Jon Hurwitz and Josh Heald. To donate and support the build for your favorite individual celebrity, please visit https://www.firstgiving.com/event/Homes4Families/Celebs4Vets-Winter-2019 by March 31. Homes 4 Families (http://www.homes4families.org) empowers low-income veterans and their families to enter the middle class through affordable, full-equity homeownership combined with holistic services that build resiliency, self-sufficiency and economic growth. Through its outcome-proven Enriched Neighborhood® model, the nonprofit provides servicemen, servicewomen and their families with comprehensive wraparound services that equip them to succeed in civilian life, including financial education, therapeutic workshops, trauma-informed programs and veteran-to-veteran support. With more than ten years of research-backed experience and success, Homes 4 Families works closely with the California Department of Veterans Affairs and others to build permanent, thriving veteran communities. Click here for more photos from the build.